On May 28, Apple’s iPad will release in nine more countries which include Australia, Canada, France, Germany, Italy, Japan, Spain, Switzerland and the UK. Pre-orders for all iPads in those countries begin today, May 10, with non-3G and 3G models available in 16GB, 32GB and 64GB sizes. In July, Apple will further expand iPad availability worldwide by shipping units to Austria, Belgium, Hong Kong, Ireland, Luxembourg, Mexico, Netherlands, New Zealand and Singapore. Apple announced it sold 1 million iPads in 28 days starting from its launch on April 4, and since its debut customers have downloaded over 12 million apps. Apple also sold over 1.5 million eBooks from the new iBookstore. 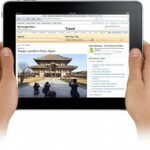 There are currently 5,000 new applications for the iPad, in addition to 200,000 applications for the iPhone and iTouch. Previous Previous post: What’s happening in gaming this month?